The Twins are looking to bounce back after getting swept over the weekend against the Rays. Unfortunately, the Twins now must travel to New York to play a four-game set against the Yankees. The lack of success, to put it mildly, against the Yankees over the years will loom large as the Twins look to take a few games during this series. The inconsistency in the Twins lineup has lead to a lot of struggles so far this year. A lot of their struggles have come with runners in scoring position, where as a team they are batting just .207. Byron Buxton is expected to return to the lineup when his is eligible to come off the disabled list on Wednesday. Brian Dozier will be taking a 23-game hitting streak into the series (dating back to 2017), while Eddie Rosario is working on a more modest 7-game hitting streak. In his last time out, Jake Odorizzi was pitching well against the Indians, having given up just three baserunners through 4 2/3, but then the wheels fell off. He gave up a two-out double, followed by a home run to Francisco Lindor. He gave up two more home runs to begin the sixth and that was the end of his night. In Odorizzi’s two starts against the Yankees last season, he gave up nine runs (five earned), and struck-out nine over 9 2/3 innings of work. What more can be said about the start that Jose Berrios has had to the year. So far this season, Berrios has allowed just 1 walk and 15 base hits, to go along with 29 strikeouts through 27 2/3 innings. Berrios has quickly established himself as the ACE of the Twins rotation. The next step will be rising-up to prominence as an ACE on the national scale. Berrios made two starts against the Yankees last season, where he gave up four runs across 10 innings. Lance Lynn’s control issues have been very apparent, having walked 15 batters in just 15 innings of work this season. His 21.7% walk rate is the highest of among all qualified starting pitchers. Lynn has done an excellent job, however, at both striking out opposing hitters and keep the ball in the ballpark. Lynn has struck out 27.5% of the batters that he has faced, and has allowed just one home run, the grand slam to Colin Moran in his first start against Pittsburgh. Kyle Gibson’s incredible string of run support (dating back to last season) ran dry on Saturday night against Tampa Bay. Gibson was having a strong start, aided by spectacular defense, until the seventh inning when things blew up on both him and Gabriel Moya. The New York Yankees have been playing better as of late, taking 3 out of 4 over the weekend against the Toronto Blue Jays. The Twins will be fortunate to avoid facing Luis Severino as he pitched in the Yankees game on Sunday. This is a welcome break for the Twins who seemingly have faced the top of the rotation against every team they have played thus far. Masahiro Tanaka’s struggles with the long ball from last season have carried over into 2018. Last year, Tanaka gave up 1.77 home runs per nine innings pitched, which was the third highest mark among qualified starters. This year that number has gone up even higher, to 2.01 home runs per nine innings pitched. 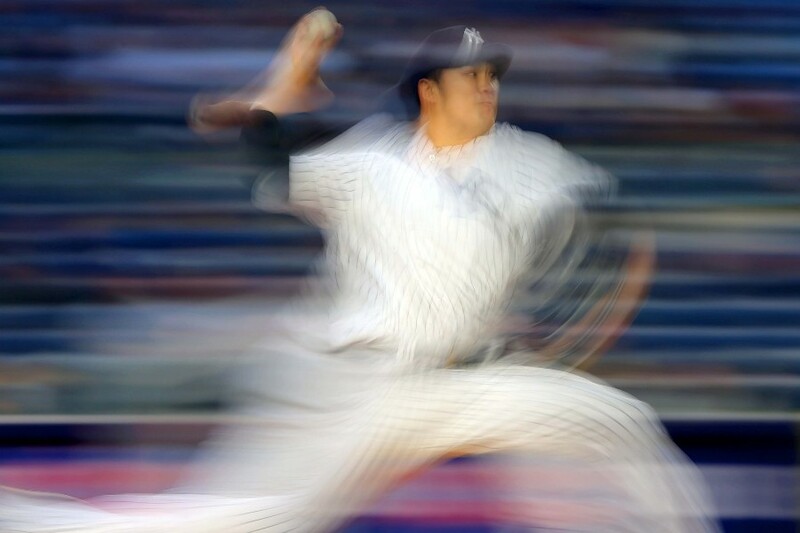 Look for the Twins to take advantage of this in Tanaka’s start against them on Monday night. He might be getting up there in age, but CC Sabathia is still a quality pitcher for the Yankees. Last season Sabathia pitched well enough to earn himself a 1-year $10 million deal to rejoin the Yankees for 2018. 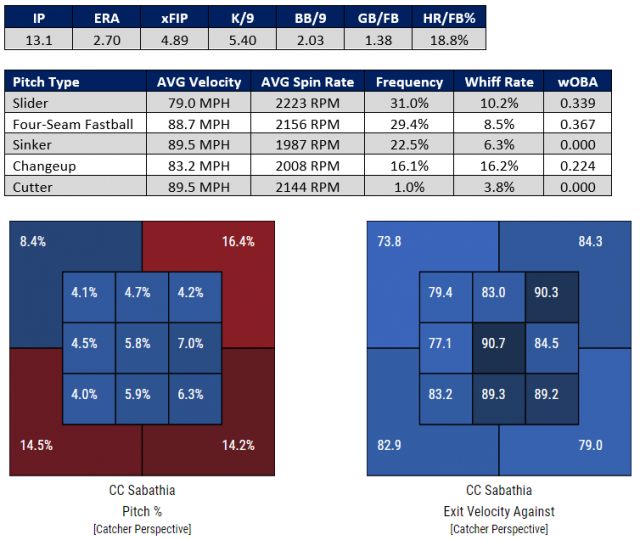 Sabathia has been pitching well this year, despite the fact that his strikeout numbers are way down. Sabathia made one start against the Twins in 2017, where he gave up two runs, and had five strikeouts paired with one walk over six innings. Much like Tanaka, Sonny Gray has gotten off to a slow start in 2018. 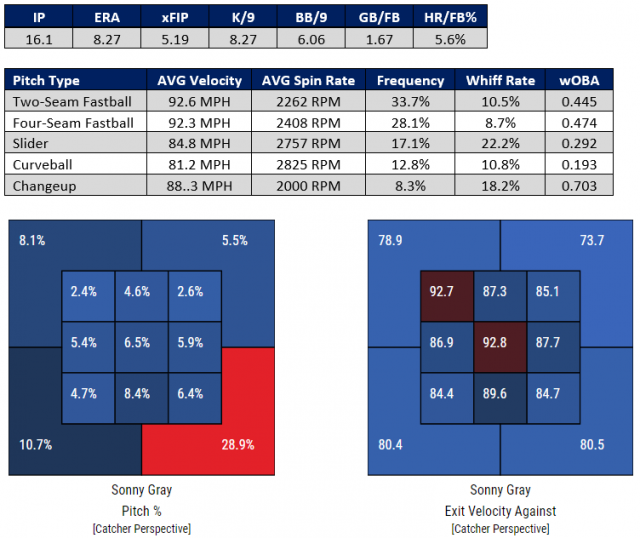 There is some concern that Sonny Gray might be dealing with an injury after his velocity was down during his last start. As of now Gray is still scheduled to make his start on Wednesday, but that could be something to monitor if he does indeed make his start. 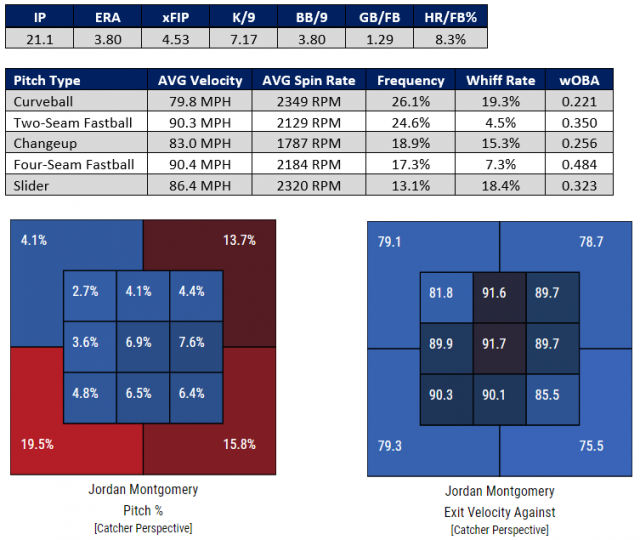 Jordan Montgomery has impressed a lot of people with his success since being called up in 2017. While Montgomery won’t strike fear in the heart of a lineup, he is still a quality starter coming out of the Yankees fifth spot in the rotation. Given the Twins struggles with left-handed pitching, this could be a difficult matchup. It has been a slow start for the reigning NL MVP Giancarlo Stanton, having made the New York headlines for the reasons he didn’t want to. Stanton is striking out at a 35% clip and has a slash line of just .195/.295/.416 entering play on Sunday. Hopefully he doesn’t find his stride during this four-game series against the Twins. Some people are calling this hot start for Didi Gregorius a breakout, but the truth is Didi has been a quality player for the last couple of seasons. His swing is perfect for the short right field porch in Yankee Stadium, which has escalated Didi from a doubles hitter up to a 20+ home run a year guy. The New York Yankees highly touted infield prospect Gleyber Torres made his MLB debut on Sunday, going 0-4, and leaving seven runners on base in the Yankees 5-1 victory over the Blue Jays. Torres has been ranked as one of the top prospects in baseball for a couple of years now, and may have made his debut sooner had he not had to have Tommy John surgery on his non-throwing elbow last summer. Addison Reed showed his first kink in the armor Sunday afternoon, giving up a walk-off home run to Carlos Gomez. Other than that, he and Ryan Pressly have been about the only two reliable options for the Twins out of the pen. The Fernando Rodney experience has been, well just that, an experience. The big question with the bullpen going forward is how long of a leash will the front office have on Rule 5 Draft pick Tyler Kinley. Paul Molitor obviously doesn’t trust him unless the game is out of reach, and at this point he is just wasting a roster spot. Coming into the season, the Yankees bullpen was viewed as perhaps the best bullpen ever assembled. However, the Yankee bullpen hasn’t gotten off to the great start they were expecting too. Tommy Kahnle’s velocity had been notably down, and now he is expected to miss the next few weeks with bicep and shoulder tendinitis. Dellin Betances has been uncharacteristically hit around. In 2017, Betances gave up just 29 hits over 59 2/3 innings of work, but so far this year he has already given up 11 hits in just 8 2/3 innings. Chad Green is quickly becoming one of the best relief options in the game and gives the Yankees some length in their bullpen with his ability to go multiple innings. Zone Charts courtesy of BaseballSavant,com. Long, painful, likely unsuccessful series against the Yankees. Will probably need Berrios' second complete game shutout to go 1-3 this series. Wow, two comments and both think it's a Yankee sweep! 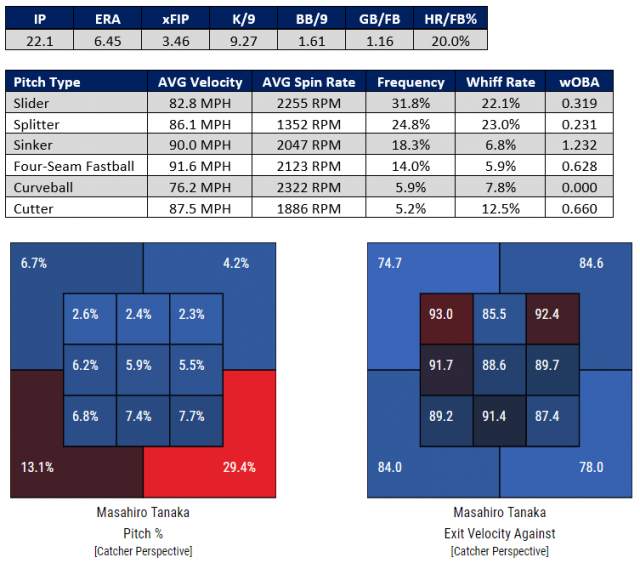 Odorizzi has not been horrible vs The Yankees and Tanaka has not looked good at all yet this season. Berrios, probably, would like to show that he should've been chosen to start the play in game. CC is just a serviceable pitcher at this point. Montgomery Vs Gibson... Well, the hometown 9 tend to score a bunch when he's pitching so there is that. Plus its Get away day game with The Yankees heading to LA. The Yankees are a great looking team that are waiting to breakout, but so are The Twins. God I hate the Yankees! Hey guys you can play with and beat the Yankees, but do it quick before Stanton wakes up to join Judge and Sanchez and Gregorius and HICKS in the new murderers row and we have to hate and envy them again. The starting pitchers are not that great - hit them.Just remember, however, that the great Mantle teams had Whitey Ford and then the list dropped to Turley, Terry, and Ditmar.They did not need Aces, just pitchers who were consistent at getting a good pitch over the plate.